Many thanks to everyone for donating and sorting supplies on May 7 & 9. 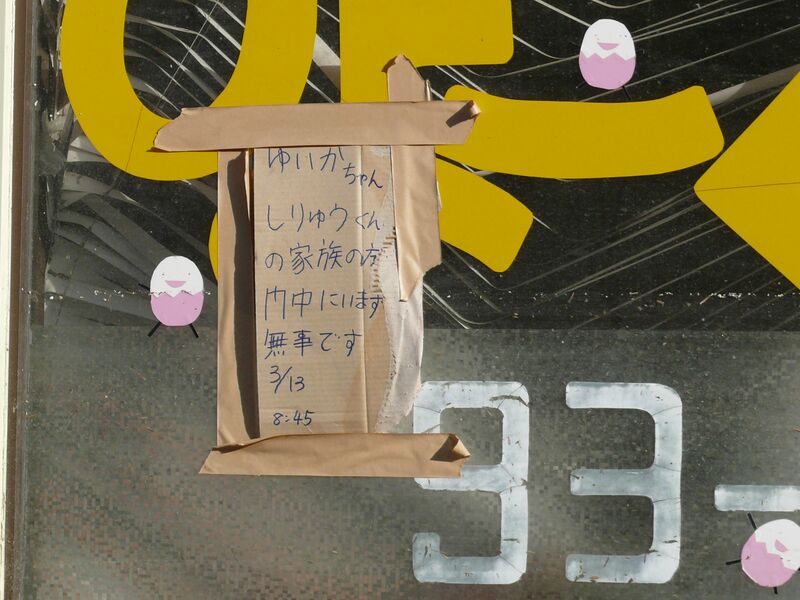 That particular shipment of goods left on May 12 and reached Ishinomaki safely on May 13. Many thanks also for the generous support of the Cash For Work program (CFW). Launched on April 11, CFW has been evolving steadily. The project started in Ishinomaki but has since been extended to include Kessennuma, both of which were devastated by the tsunami. Working with the Yamagata based NGO, IVY, Second Hand is funding the project in Ishinomaki. We donated a little over 2 million yen at the beginning of May. This is enough to employ 20 people for 1 month. Here’s a brief outline of the program content. Before starting, workers are provided with work clothes, including protective gear, and professional instruction on safety and work content from a construction company. CFW employees work in teams of four to make houses habitable. First they remove the floorboards and shovel mud and debris out from beneath the house. The ground under the floor is then washed and disinfected, the floorboards are replaced and the house cleaned. 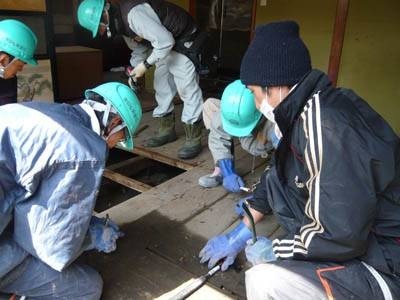 The teams in Ishinomaki finished about 20 houses in the first 2 weeks. 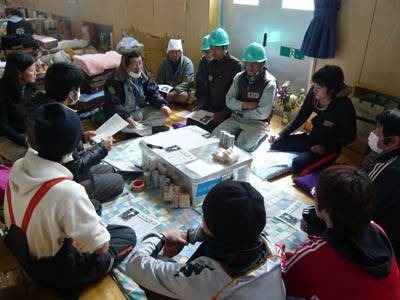 At the beginning of May there were 11 Cash for Work staff in Ishinomaki and they were working on two houses at a time but if this is increased to 20 staff they can work on four houses at once. The CFW project has also hired 6 local people as coordinators, 3 in each town. They interview prospective workers, procure work tools and equipment, find clients and match them with teams of workers. They are able to communicate very well with the clients and the workers and find the work very rewarding because they, too, have experienced this disaster. Workers are paid in cash at the end of each day. Initially, they received 3,000 yen per day for 4 hours of work (750 yen/hour) but the workday was extended to 5 hours and the hourly wage raised to 800 yen to better meet their needs. Due to potentially toxic substances in the debris, the number of hours in Ishinomaki is currently limited to protect the workers’ health. There has been a very positive response to this program and it is clear that local people desparately need temporary work for cash income. So please keep the support coming while the need lasts . Thank you!! We will be collecting the following supplies from May 7 (Sat.) in Marugame and May 9 (Mon.) in Takamatsu. Volunteers are very much needed to help sort and pack the goods on those days! Please contact the Second Hand Office for details (087-861-9928). The Cash For Work Project* is off to a good start. The project provides jobs to local disaster victims, helping them to stay and rebuild their communities and supporting a smoother economic recovery. Twelve people have already been hired in the initial phase. 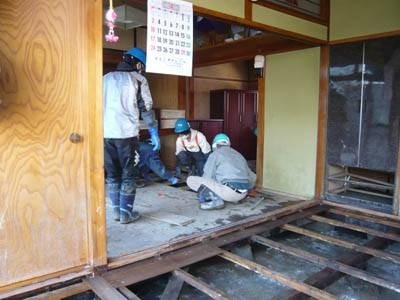 They are being paid 3,000 yen/day (750 yen/hour) to make homes inundated with dirt and debris livable again. Teams of workers are matched with local residents who are unable to clean their homes on their own. The project is being advertised through Hello Work and through the shelters. The response has been positive and the lessons learned will be applied as the project is expanded to hire more people and gradually extended to a broader area. *Cash For Work is an internationally recognized method of recovery and was effectively used after such major disasters as the Sumatra earthquake and tsunami 2004 and the Haiti earthquake. The project is being coordinated by the Tohoku Region Earthquake Relief NGO Center and Second Hand is handling fundraising. Many thanks to everyone for donating to the Tohoku disaster relief efforts. All donations to Second Hand that are earmarked for the disaster relief fund are used solely for disaster relief. We expected to spend a substantial amount of funds on shipping costs but thanks to the cooperation of businesses and individuals who have supplied trucks, drivers and fuel, so far no shipping costs have been incurred. We deeply appreciate this support. Second Hand has been collecting and delivering essential supplies for disaster victims in the cities of Natori and Ishinomaki in Miyagi prefecture. We have delivered more than 30 tons so far to shelters and homes. Each time we go, we listen to the needs of the local people. Many residents have no cash at hand to buy necessities and, for various reasons, much of the money donated to major charitable organizations has not yet been distributed locally. Jobs are needed to provide cash income. In addition, many people want to return home now that lifelines are being restored but they need help to clear their houses of mud and debris. In response to this situation, a Cash For Work project is being launched through the Tohoku Region Earthquake Relief NGO Center*. Local people seeking work will be paid in cash by the day to help people clear their homes and make them livable. Please Help Support This Project! Cash for Work encourages smooth economic recovery in disaster regions by providing jobs on rebuilding projects to local disaster victims. This method has been used effectively for recovery after major disasters such as the Sumatra earthquake and tsunami of 2004. The Center, which was established on March 14, is a network of 30 NGOs, companies and local governments serving 3 cities and 2 towns on the northern coast of Miyagi prefecture. The Center responds to the daily needs of these communities by delivering supplies, sending volunteers to shelters and medical centers, coordinating activities, providing information, etc. Here is a brief outline of what we have been doing to date, starting with the most recent activity first. Many thanks to all our supporters for donating money, supplies and manpower, and for volunteering to sort, pack and ship the supplies. Without you, none of this would be possible!! 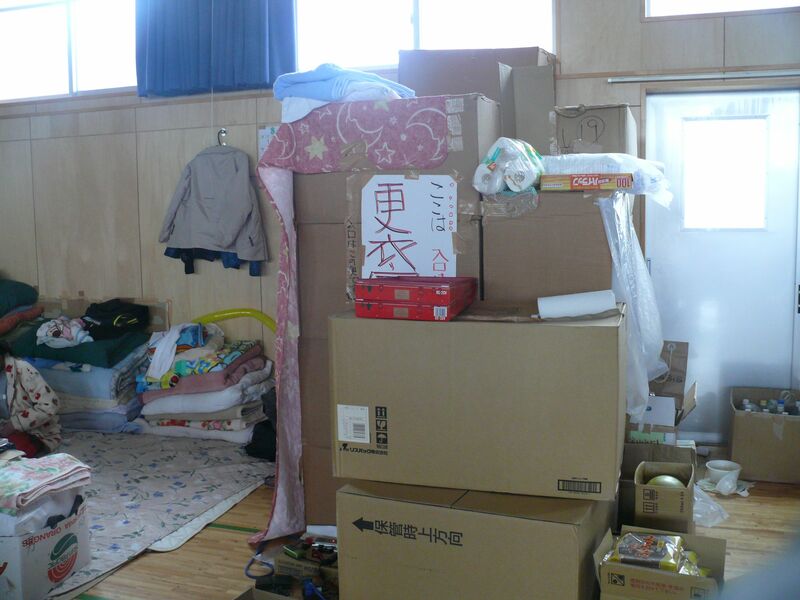 April 12: Sent a 6-ton load of supplies including cardboard partitions supplied by Keizu Shipping Co. to provide privacy in the shelters, as well as abacus, and futon to Ishinomaki. Included in this shipment were blankets, disposable diapers and other items collected by Takamatsu city. Also sent udon (noodles) and soy sauce donated by a local company to Iwate prefecture. April 10: Held a public meeting to report on activities to date, conditions and needs in the disaster area, and on the response to the aid provided to date. Attended by 34 people including representatives of the Takamatsu municipal government and the press. 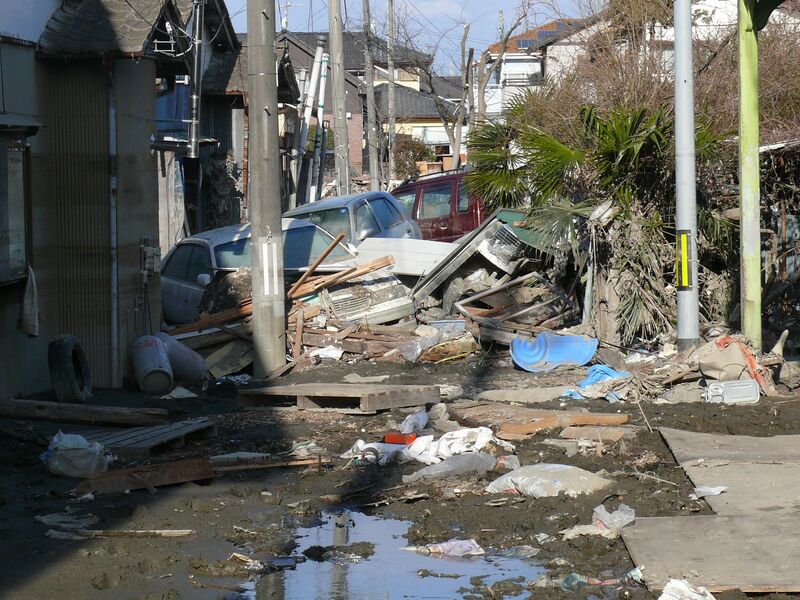 April 9: Contacted by a Takamatsu resident who offered to transport supplies in their car. This person was going to Miyagi to search for missing relatives. Supplies sent included notebooks, writing materials, etc. for the abacus classroom as well as soap and other daily necessities. April 2: Delivered 6 tons of supplies to Onagawa in Ishimaki, Miyagi prefecture. We concentrated on reaching people who are isolated in their homes or small, improvised shelters. These people do not have easy access to the supplies delivered to the official shelters. We are working with key people in the locality to identify local needs and make sure supplies reach those who need them most. All shipping costs including the truck and driver were covered by Hayashida Distribution Service (Sakaide City, Kagawa: President Shiota). 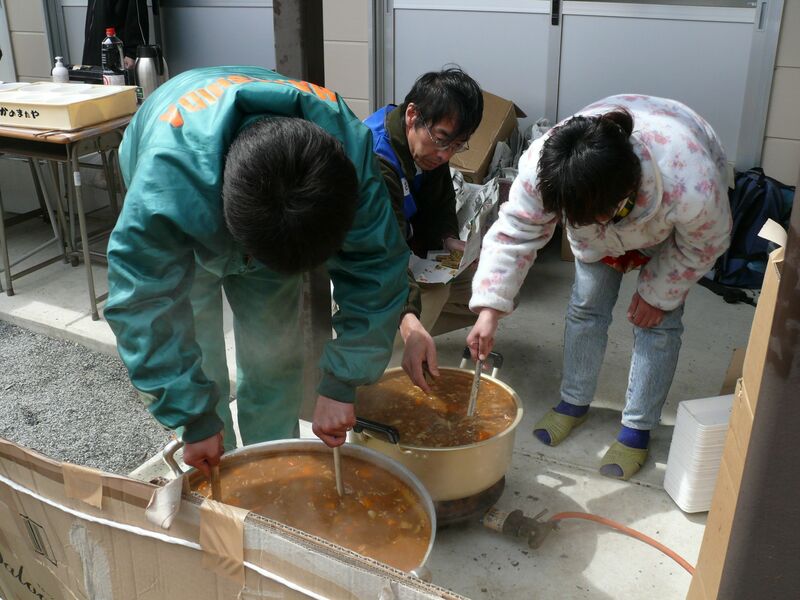 March 29-31: Cooked hot meals (total: 600 servings) at shelters in Ishinomaki, Miyagi. Second Hand volunteers supplied a 4-ton truck, a temporary kitchen and ingredients. They also carried and delivered necessary supplies for the local people. One Second Hand staff accompanied the truck to survey local needs. March 25/26: A volunteer from Takamatsu traveled to Natori and Ishinomaki and delivered medical supplies for TICO and diapers, sanitary towels, toothbrushes, wet wipes and rice supplied by Second Hand. 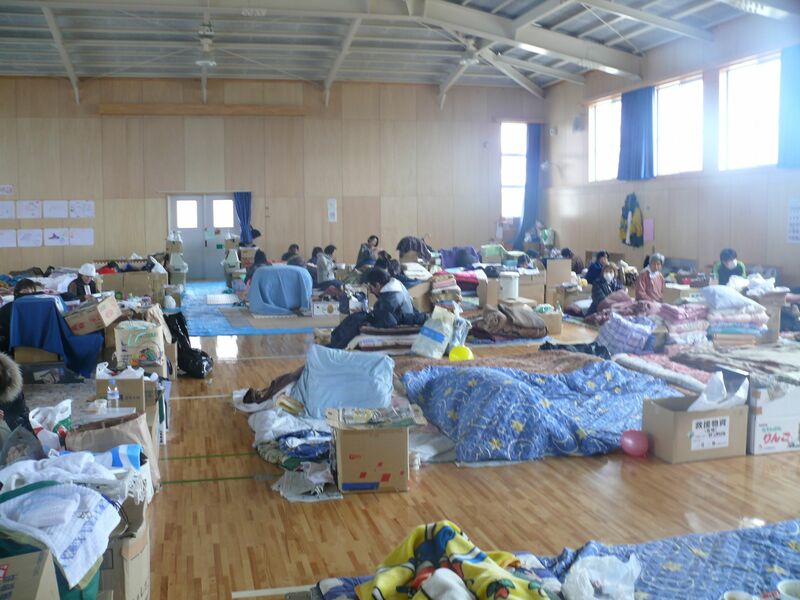 March 23: Collected, sorted and packed additional supplies needed by the Ishinomaki High School shelter. Shipped 41 boxes the same day. 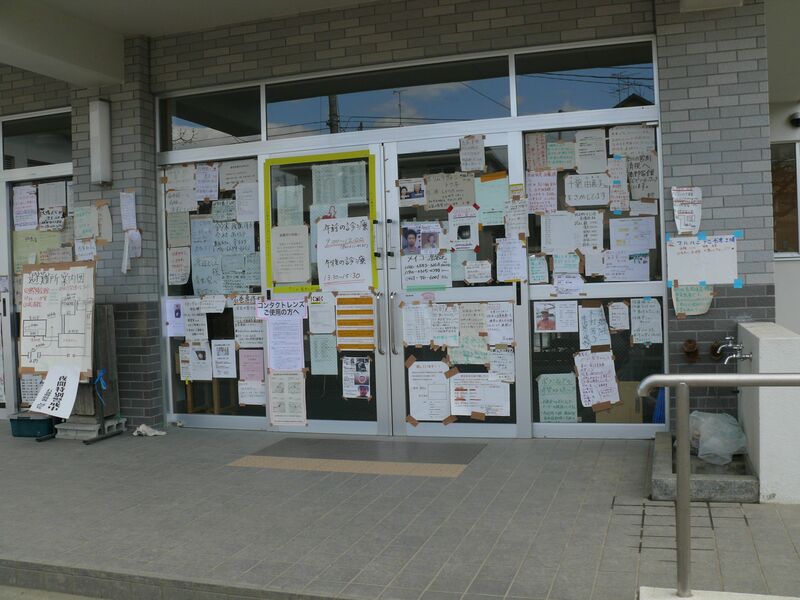 March 22: Made contact with a coordinator in Ishinomaki High School shelter through a reliable source. Gathered supplies in response to specific needs. Sent 30 boxes via a local delivery company. Delivered supplies on March 24 and distributed them to those in need. March 17-21: Began an appeal for goods in the morning and continued to collect supplies over the next 4 days. Packed a 10-ton truck with supplies on March 21. 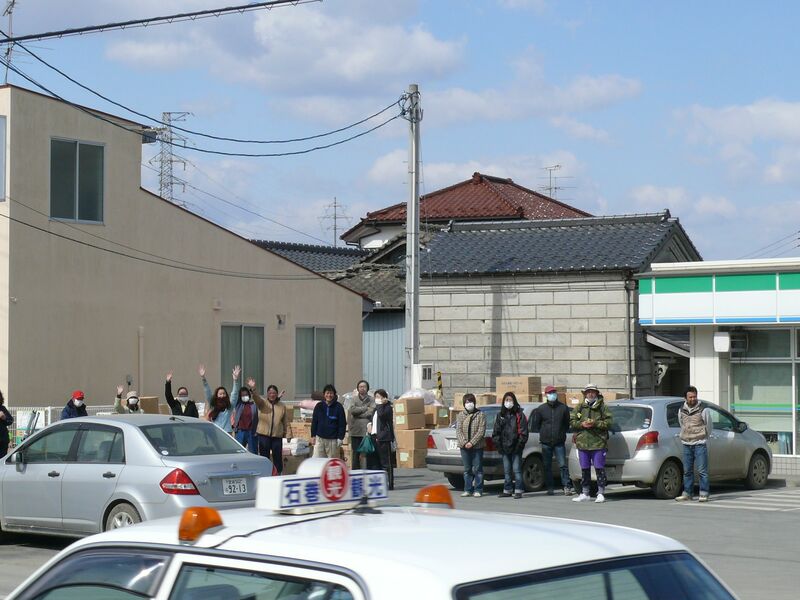 The truck reached the designated shelter in Natori, Miyagi on March 22. 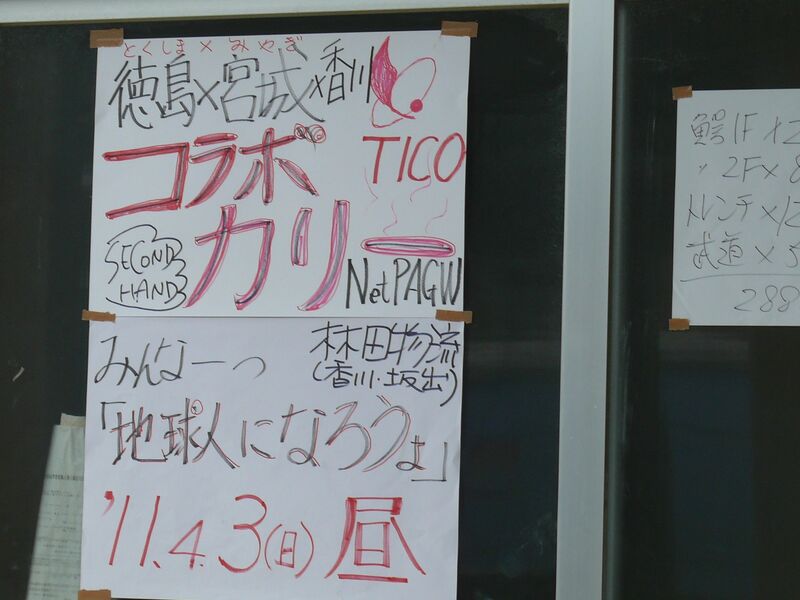 Worked with TICO, an NGO based in Tokushima, to provide needed supplies to Natori. The 1st shipment was a 4-ton load sent from Tokushima. Our first delivery was to the same place as the previous shipment – a makeshift shelter in a general store that had survived the tsunami in Ishinomaki. We unloaded 6 tons of supplies, including futon, pillows, food, and baby supplies. A line of over 100 people gathered outside the shelter and the goods were distributed with a limit of 5 goods per person. Everything was gone within 30 minutes. The shop owner is a former member of the Japan Overseas Volunteers Corps. We have asked her to survey the needs in the surrounding area so that we can make a plan for distributing supplies directly to households in distress. Here, too, good partners like this are essential for providing effective aid. At the high school shelter, I joined members of the Tokushima International Cooperation Organization (TICO), an NGO from Shikoku that we work with in Cambodia. Together, we made curry and rice for people in the shelter. The truck driver joined in the cooking, too! Poster announcing the curry meal! I met with the leader of the shelter, Mr. Takahashi. Struggling to keep back his tears, he told me, “Second Hand was the quickest to respond to our requests. It is so clear from the supplies you send that you have really thought about us and about what we need. Your help has provided the energy that keeps us going in our relief efforts… Nothing you sent was useless.” To all of you who have contributed, please know that your caring and compassion for the people in the disaster area has reached their hearts even through the supplies we’ve sent. Changing room made from cardboard boxes. There’s no privacy in the shelter. Many missing person notices are posted here. The Ishinomaki High School Shelter will be reduced in size from April 20. Those who remain face a long struggle ahead and Second Hand intends to continue responding to their changing needs. A scene a short distance from the shelter. Many destroyed homes have signs like this saying where the occupants are.